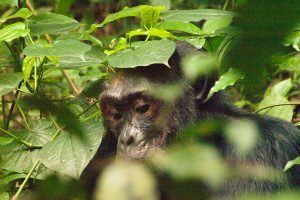 The 3 Days Murchison Falls Wildlife Tour shares with you an impressive animal populations and superb activities further augmented by the safari park’s location, which straddles the Victoria Nile as it makes its way through multiple rapids and waterfalls (including the enormously impressive Murchison Falls) to Lake Albert. Murchison Falls national park is an exceptional place to see wildlife and a trip along the Nile will not be missed on this safari, not least in order to see the powerful Murchison Falls up close, a simply unforgettable experience. Murchison Falls National Park is Uganda’s oldest park located at the end of the Albertine Rift Valley. It is divided by the Victoria Nile, in a 44m massive water drop over the remnant rift valley wall, creating the dramatic Murchison Falls, the center piece of the park. 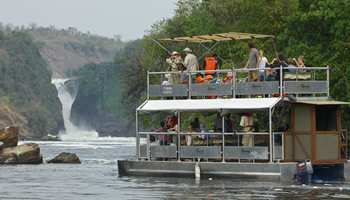 The Murchison falls are known to be the world’s most powerful water fall. The park has hosted visitors like former British Prime Minister Winston Churchill; and former American president Theodore Roosevelt among others and is also home to several bird species and mammals. After breakfast, your Murchison Falls wildlife tour guide will pick you up to transfer to Murchison Falls National park a must-see for variety of wildlife with a stopover to visit Zziwa Rhino Sanctuary. The Zziwa Rhino Sanctuary is privately run by Rhino Fund which works towards restoring rhino populations in Uganda’s wild. Rhino Fund also protects the re-introduced Rhinos into Uganda’s wilderness for rhino tracking. We’ll have lunch at Zziwa Rhino Sanctuary and thereafter continue to visit the top of the falls in the park and take amazing photographs before proceeding to check in for the night. A game drive at dawn will take you and your Murchison Falls wildlife travel mates to spot a variety of early riser nocturnal animals, birds and other wildlife like the big five which include: lions, buffaloes, giraffes, elephants, leopards, warthogs, water and bush bucks, topi and oribi. Return for breakfast and relax till lunch is served and go for a boat cruise along River Nile that finishes close to the bottom of the falls. 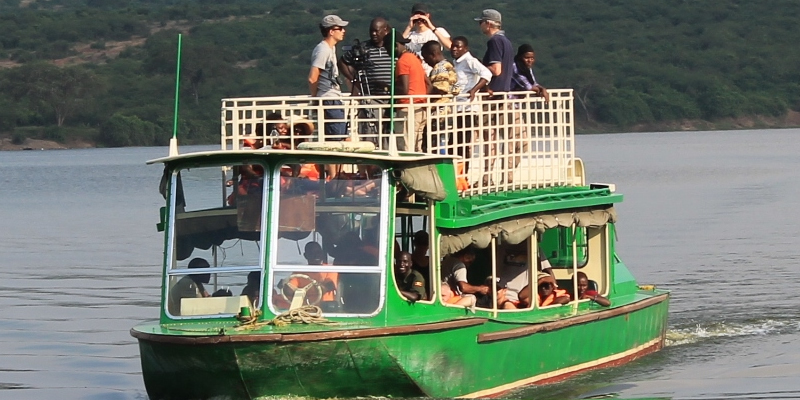 On the boat cruise watch out for hippos, crocodiles, and birds like the African Fish Eagle along the river banks and take a stunning variety of photographs. At the bottom of the falls take a hike to the Top of the Falls (approx. 1 hour) to see where the world’s longest river explodes violently through a narrow cleft in the Rift Valley escarpment to drop into a foaming pool 44m below. After breakfast, drive back to Kampala with game viewing opportunities as your exit the park for the last hours of the Murchison Falls wildlife tour, you’ll have a lunch stop along the way. Continue to be dropped off at the airport for your return flight home. End of the Murchison Falls wildlife tour.